We are used to glitches with new ski touring gear but when a piece of kit lets you down it can still come as a shock. This is felt even more deeply when negociating a tricky descent far from civilisation. We place a special reliance on bindings but at the same time demand both uphill and downhill performance. A binding must tour well, letting us climb to the top of a mountain or pass with the least effort, then it must hold our foot securely for the descent while at the same time forgiving any errors we might make. The Naxo ski binding is now in its second season. The binding goes head to head with the Diamir Freeride. Naxo make big claims for both its on and off-piste ability. However there been reports of failure in the advanced materials used in the rear cocking lever and the toe piece. Mammoth based asandygal [Asg] tells us she was on her fourth turn into Upper Dry Creek when her left ski started to do funny things, she face planted and slid half way down the run, “thinking back, and hearing the first hand accounts from people who saw me eating it… the cracked binding actually caused the fall, rather than was ‘caused’ by the fall. 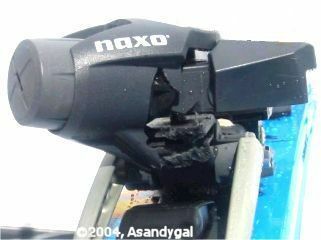 The US importer of the Naxo binding, BackCountry Access were extremely worried about this incident and called Asg. It seems the bindings were part of the first year’s batch and may also not have been the right length for her boots. The Naxo is available in three sizes. BCA have already put a pair of next season’s bindings in the post and say that Naxo has improved the 2004-5 binding based on experiences this season. We are awaiting a full report from Naxo but it is worth checking these points if you are thinking of upgrading anytime soon. Those ‘fire-sale’ 2003 season bindings may not be such a great bargain.